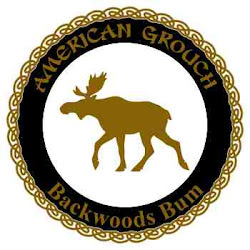 I've been buying products from Bushcraft Outfitters for a while now. I've always had great service, very fast shipping and everything I've bought has been as described and met all of my expectations. There are two items I want to talk about. Both were used during my recent Boundary Waters trip and performed flawlessly. The 10x10 Bushcraft Tarp and the 5x7 Multipurpose Emergency Survival Tarp. Let's start with the 10x10, specifically the Multicam variant. 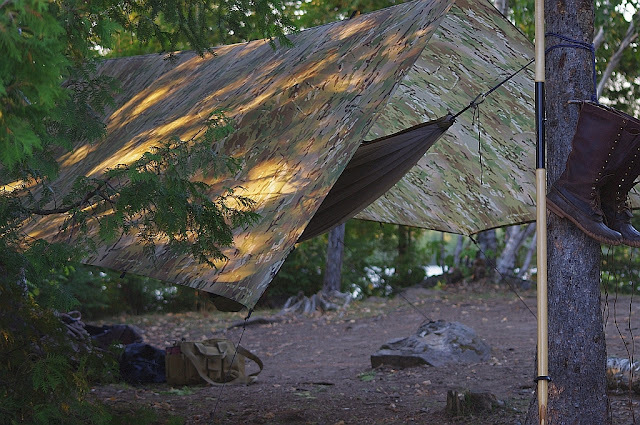 This premium mil-spec material has many advantages over the standard backpacking/camping tarp. 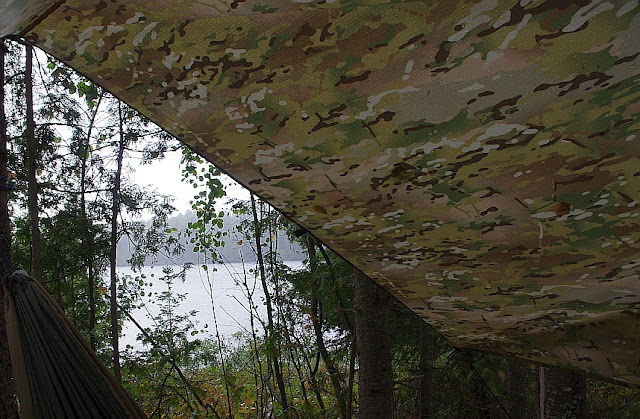 The MultiCam® fabric has up to five time the amount of water repellant coating of other tarps, which producs a more durable finish. Unlike other standard backpacking tarps, this material is also fire retardant, as well as IR compliant. 1. 16 perimeter tabs, these incredibly strong and strategically placed tabs absolutely drive the usefulness of this tarp through the roof. No matter the set up or the situation I've found them to be exactly where they needed to be for my uses. Using them is very easy, from a traditional method of running a cord through them, to my preferred method of putting a 'bite' of cord through the tab then a twig through that, they all worked. 2. The 1-1.25 oz of Urethane coating per square yard, yeah, it works and man o man was I happy to have that level of protection in the Boundary Waters. The temps had dropped into the upper forties, the rain was steady and heavy through the morning. I was bone dry and happily snoozing in my hammock under that tarp. The Multicam fabric offers up to five times the water repellent coating of other tarps, from my experience with other tarps, this is not an exaggeration. 3. Fire retardant, this is a key piece for me as almost all of my backwoods overnight and extended trips include open fires. Longfires in the winter with the tarp as a reflective back drop. This feature is of paramount importance for me. This is an image from under the tarp, sitting on my hammock. As you can see, the water beaded the outside of the tarp but the inside remained bone dry. Day in day out this tarp was easy to use and resilient, it blocked both the rain and the wind. I can't say enough good things about this product. 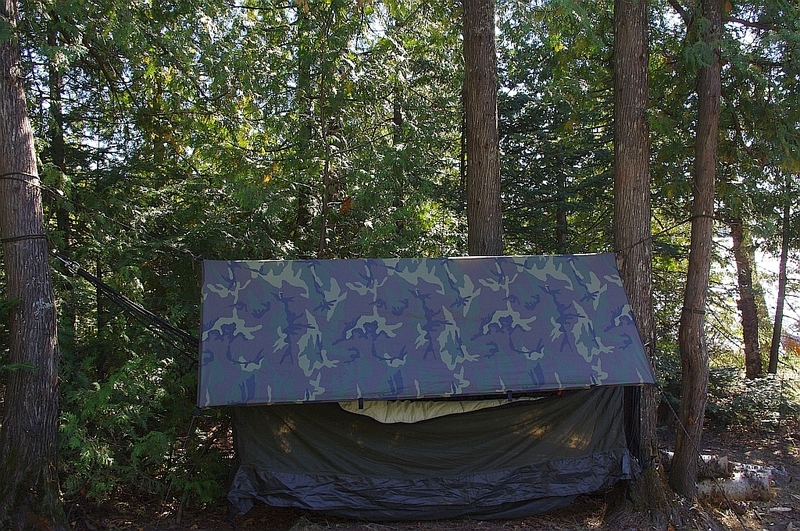 Kudos to Bushcraft Outfitters for carrying this made in the USA tarp. The tabs, 10 in total, similarly to the bigger 10x10, were in all the right places with the same strong stitching found on the bigger tarp. It's super light and folds up very small. The Urethane coating was sufficient to keep out the rain and it worked very well. The size is just right for an emergency shelter, when hit by an unexpected overnight or just to get out of the rain on a midday hike. 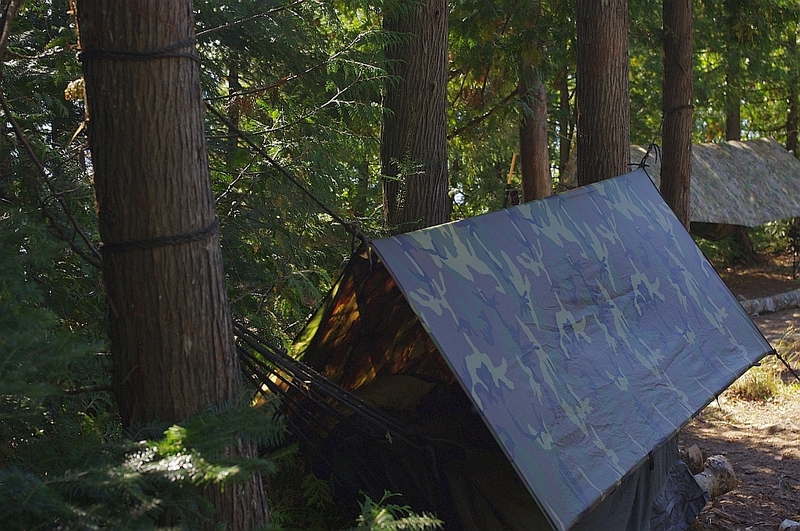 You can't go wrong with either tarp, for durability, functionality, light weight, they've got it all in one package. From prior experience usually something had to be sacrificed, to save weight durability went down, to have great water repellent capability either weight went up or they were very noisy. These are the best tarps I've used and would recommend them to anyone who spends time in the outdoors and prefers open vistas and versatility of tarps over tents. 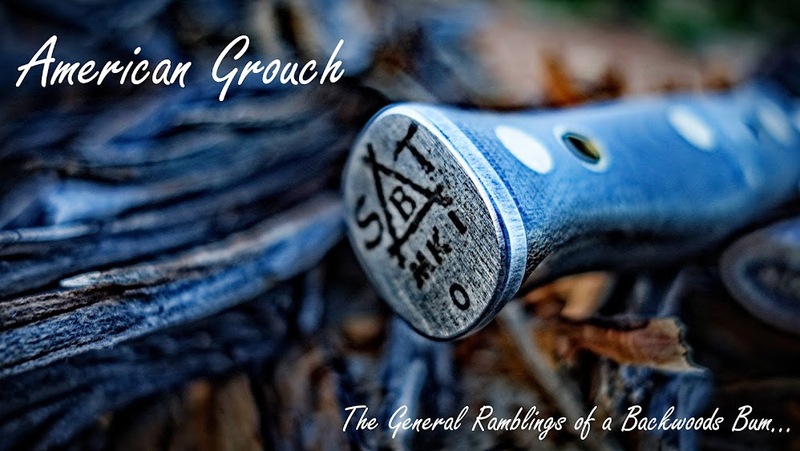 To my knowledge these are exclusive to Bushcraft Outfitters and are not available from any other vendors. Great product, great price, great company to do business with. From what I hear, you can get them directly from Etowah (the manufacturer of the tarps) for a bit less and in different colors. Etowah calls the 5x7 one a groundcloth. If you contact the manufacturer, they can get you exactly what you want. I love using tarps, and have been very happy with the Etowah ones. Great customer service. I ended up on the phone with them when I was sourcing material for my Whelen Lean-To project. They put onto their source and so I went that route. Ultimately, if you can source the material and have the means then making your own results in a superior product. Grouse, it's what's for dinner!